Today David Lama is one of the most successful professional climbers in Europe. But at age 19, his climbing career almost ended before it even began. In the austral summer of 2009/2010, Austrian climbers David Lama and Daniel Steurer made the long journey to Patagonia with their sights set on doing the first free ascent of the southeast ridge of Cerro Torre. The son of a Sherpa father and Austrian mother, David started climbing at an early age and exhibited a preternatural gift for this sport that earned him fanfare and big-time sponsorships, including Austria’s largest sports beverage company, Red Bull. David’s objective was to be the first person to free climb the southeast ridge of Cerro Torre, one of the toughest mountains in the world. This objective had already been tried by some of the best alpine climbers in the world without success. It was an audacious goal. Were he to succeed, it would be major news and a great story worth telling. Adding to the climb’s interest, the southeast ridge of Cerro Torre holds an infamous place in the annals of mountaineering as the site of controversy. To make a very complex story short, in the 1970s an Italian climber named Cesare Maestri placed over 450 bolts on the mountain using a gas-powered compressor, a wholesale construction project that incited climbers such as Reinhold Messner to denounce the ascent as the “murder of the impossible.” The climbing community continues to debate the demerits of these egregious actions over 40 years later. David’s sponsors recognized that this would be an incredible story to capture, and Red Bull put together a seven-figure budget to make a movie about their star climber’s efforts on Cerro Torre. Still rather young and inexperienced, David Lama inadvertently ended up becoming the face for yet another Cerro Torre imbroglio that all but ended his promising climbing career. One of the riggers on the film project added at least 30 bolts to the mountain, apparently for the safety of the camera crew. To the climbing community, however, this act was as sacrilegious as spraying graffiti on the walls of Mecca. Though he didn’t personally add those bolts, overnight David Lama became the most hated climber in the world: a symbol of brash young egotism that lacked vision, talent, boldness and respect for mountaineering. Any lesser human would’ve been crushed by this degree of community ire, not to mention the public relations nightmare David had created for his sponsors. But not David. To his credit, he really stepped to the plate, matured, and apologized profusely on behalf of himself and his entire team—eventually accepting full responsibility despite the fact that he didn’t actually place any of the problematic bolts himself. David returned to Patagonia two more times and eventually achieved his goal of free climbing Cerro Torre. When he free climbed the mountain in 2012, it was in perfect style without the help/aid of any bolts. He had achieved his goal and in the process, he both greatly matured as a climber and regained the respect and admiration of the entire climbing world through his talent and actions. Pretty incredible, if you think about it. As grim and dark as life got for young David during this three-year saga with Cerro Torre, he never gave in, and he always held fast to a positive, optimistic attitude that better days lay ahead. 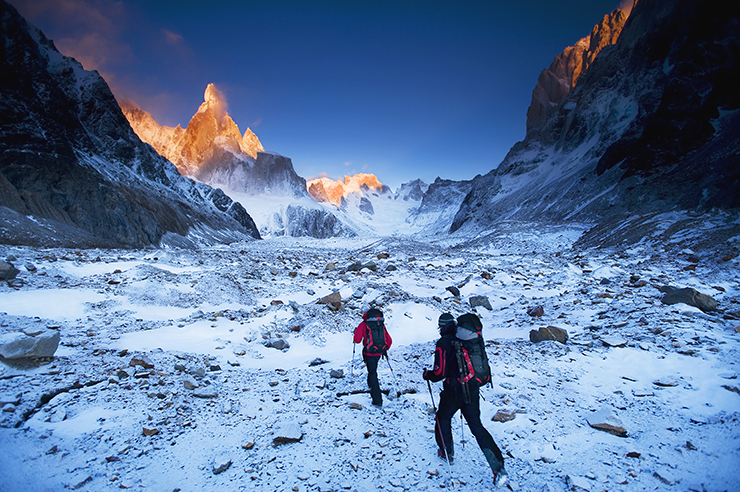 This picture of David Lama and Daniel Streurer walking through a dark valley toward a brightening, sun-kissed Cerro Torre has become a really apt visual metaphor for David’s optimistic attitude, and I often look back on this picture to remind myself how important it is to maintain a positive approach, whether that’s in the mountains or in the business of photography. No matter how dark the valley gets, it’s good to remember that you are responsible for shaping your future, and that better, brighter times are up ahead. I recently returned from the 8th annual Adventure Photography Summit Series workshop in Jackson Hole, a workshop in which I am a cofounder alongside one of my mentors, Rich Clarkson. Rich Clarkson is in his 80s, but his mind and attitude are as sharp and optimistic as any college kid. He is one of the great living legends in the photography world, a storyteller who has virtually seen and done it all. As a teenager, Rich fell in love with journalism, interviewing guys like Orville Wright and running in the same circles as guys like Ansel Adams. Rich went on to become one of the most decorated sports photographers of all time, shooting for Sports Illustrated as a contract photographer, not to mention other major publications like Time and Life magazines. Mind you that this was back in the heyday of magazines, when those publications held as much sway as the hand of god when it came to determining which photography careers lived and died. Rich then went on to serve as the director of photography at National Geographic and The Denver Post. His perspective on this industry is invaluable. But perhaps his greatest gift is his amazing ability to select the most talented young photographers in the world, and bring them up. He has probably identified and mentored more great photographers working today than anyone else. Essentially, what I’m trying to say is that when Rich Clarkson speaks, you best shut your trap and listen up to what The Man has to say. “Let me just make something real clear guys,” he said. “You know, I’m tired of hearing people talk about how the future is not bright. The future for photography and filmmaking and journalism has never been brighter! “Has journalism changed? Yes. Certainly journalism has changed. You’re not going to go shoot black-and-white for newspapers. And you know what? Frankly, you should be thankful that you’re not going to shoot black-and-white for newspapers because that’s a thing of the past. “The future is this thing called the Internet. The future is this thing called technology. Today we photographers, journalists and filmmakers get to write our own tickets. When we have stories that we’re passionate about telling, we have more freedom and more resources available to us than ever before. Equipment is affordable and our potential outreach is unlimited. Wherever that funding comes from, whether it’s philanthropic sources, a corporate underwriter or whether it’s by working in a 9 to 5 job, you can get it. “We not only have all the sophisticated tools and channels we need to tell our stories online, but we can deliver those stories to a targeted audience instantly. And if your story is really well told, then guess what? It does this thing called, ‘It goes viral,’ and millions of people see it. “Not only that, but if you’re doing it really well, you can actually sell the advertising on your site. All the old publishing paradigms have changed, and the power is now in your hands. Don’t lament today’s new media environment. There are more opportunities for creative individuals like yourself, like everyone here, than ever before. “We are no longer just photographers. We are all-encompassing storytellers. We are self-publishers. We do our own promotion and marketing. We build websites and fill them with incredible, original content. Today you are only limited by the scope of your own imaginations, and the originality of your own creativity. Everyone in the workshop was sort of left reeling after this incredible monologue (which, again, was twice as good as what I’ve paraphrased above and I only wish that someone in the room had recorded it). We all sat there silently for a moment feeling these waves of optimism washing over us—empowering us. The message was as clear as day: Don’t ever complain about the state of publishing and media today because, in the 80some years that Rich Clarkson has been on the planet, this guy thinks that right now we are living in the most golden moment ever for entrepreneurs, photographers, filmmakers, storytellers and journalists. And that was a pretty amazing idea for everyone to hear. It was a good reminder that, no matter how dark the valley may seem, maintaining an optimistic attitude and continuing to persevere forward in the face of adversity, will get you to the top in good style. Thanks to David Lama and Rich Clarkson for being living examples of this message. Great photo and story! Thnx for posting inspirational content both from a photography and entrepreneurial point of view. Can very much relate to the importance of telling stories, and the fact that we have every resource available to do so. Will continue to check in for more niceness..
Iam just at the beginning of planning m own business as outdoor photographer and find a lot oft collegues crying about present/ dont even talk about future. I work since 1990 as photographer and its thrue that work has chanced; also in Europe.The words of Rich are so thrue, and i hope many people feel the positive Vibrations like i do. Sry my Bad english! wow, great story and love that image. Great story and thanks for all the inspiring stuff you share! Keep up the great work. You and I met three years ago in NY at PhotoPlus. I have watched your work ever since. Forgive me if this gets personal but photography to us iS personal. Some may say it is our everything. Because of photography I have followed you and your friends thru drone shots over kayaks and boom shots of free climbers. Because of photography I have watched you meet the love of your life and give birth to life. Because of photography you have forced me to rethink why I love being a photographer, and for that I thank you. To that kid who wanted to know what the future holds for you? It holds what you are willing to give TO it, not take FROM it. Every Saturday I go to my daughter’s soccer game and share the pics with the team. I am the team photographer, make that, the team historian :). The parents of her friends thought the pics of the team that they bought behind a cheesy background were good enough….until they saw the pics I took of the girls in action. The pics I take capture moments in time. In ten years they will look back on the pics and remember their big girls as little girls. People look back on my wedding pictures and remember the happiest moments. At 46 I have realized after 34 of photography, I grew up in my father’s studio, that I needed to stop looking at photography in terms of dollars. I started to realize how important it was to the history of people’s lives. I was in Facebook the other day my friend posted a picture of her mother when she was like twenty. I knew it was a picture my father took of her just from the style. My father said it was the first picture he took of her. 40 years later his ART is still my friends timeless moment in history. Be an artist. Be a historian. In forty years my grand kids will be asking me what the internet was as they are using mental telepathy to capture an image and etch it on some new wave techno screen as they ask me what a cordless landlinephone is like I ask my grandparents what a rotary phone is. All I will have to do is show them a picture. Photography and Videography has never been more important. We have grown over the years from a monotone picture on crappy newsprint three days old to a world full of color and vibrancy of both the good and the bad that happened, as all news anchors say, just moments ago. Those moments ago are because of you, Corey Rich, and because of you, 20 year old who wanted to know where the state of photography is.